Claude Monet is known to have painted 'en plein air' - outdoors - which often leads people to believe he always did that with every canvas. Not so. Monet had a variety of painting techniques and often produced canvases from memory using oil sketches he had made 'en plein air.' And other times he painted entire works inside his studio with no outside work at all. Makes sense to Ciwt. 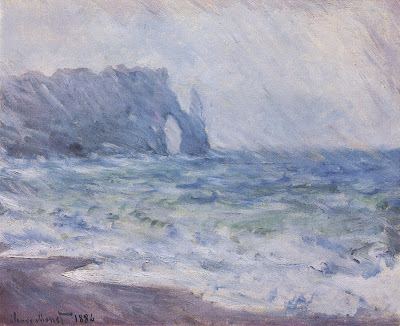 On this day, she certainly wouldn't have wanted to have to do her Monet research in the wind and rain. And she can only imagine the difficulties of keeping a canvas and easel upright and the paint and brush usable - as well as staying dry and warm - standing seaside in a howling Normandy coast storm.